This has become such a serious problem because so many hypothyroidism sufferers are incorrectly and dangerously using exercise as a means of trying to control their weight. You can’t blame yourself though. The reality is, even your doctor, who is supposed to actually know what is best for your health, tells you that you need to exercise to lose weight and get healthy. It’s maybe the biggest thyroid exercise myth out there today. Yet, when nobody stops to actually consider the physiology of the body and how exercise impacts your entire hormonal system (thyroid included), you end up getting yourself into big trouble. Yes, I understand that society today is obsessed about weight loss and the ridiculous idea that simply losing weight is the solution to all of our health problems. If that were true, then why are so many non-overweight people suffering from hypothyroidism, cancer, autoimmune disease, heart disease, and every other disease for that matter? In fact, I work with a number of clients who are severely hypothyroid and underweight. If we take a minute to step back and look at the big picture, then we can see that exercise isn’t always healthy. More importantly, in some cases it can be quite thyroid suppressive and even dangerous to your overall health. Remember Bob Harper, host of the weight loss TV show, The Biggest Loser? In February of 2017, he suffered a major heart attack while exercising at the gym, and was even pronounced dead before being revived. Even though he appeared to be in excellent physical health, he had high cholesterol, which is directly associated with hypothyroidism. At first, he blamed genetics, but he abandoned that explanation because it contradicted his message that people could radically change their physical health. …Which is also directly related to thyroid function. So, it’s not just people who are overweight that can risk injury, or even death, by exercising too much, or exercising in the wrong way. A large part of the problem can be attributed to poor interpretation of research, lack of knowledge, and a lack of understanding of the human body. …the purpose of this article is really to open your mind so that you can see how little is generally understood when it comes to exercise. 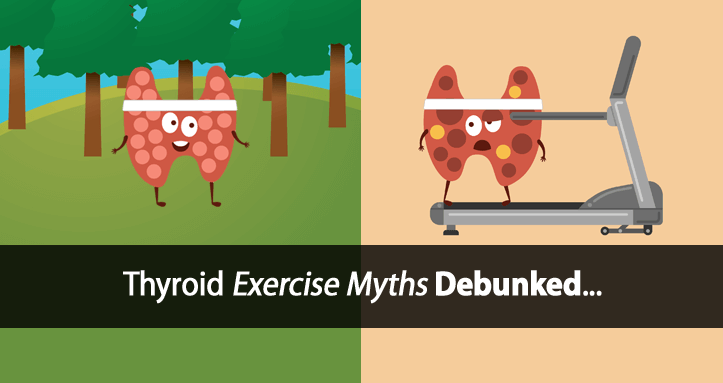 So, I’m going to discuss a couple of very common thyroid exercise myths just to show you how we don’t always know what we think we know. If you look at current research, a lot of people are incorrectly led to believe that exercise improves thyroid function. There are studies where blood samples were taken immediately before and then immediately after exercise in order to analyze the amount of thyroid hormone in the blood. Many of these studies have found that some forms of exercise cause an increase in blood level thyroid hormone, and so they interpret this as evidence that exercise improves thyroid function. Using a basic understanding of cell physiology, when cells become fatigued or overworked, they take up more water. This is a natural response to stress. So, when you exercise, as your muscles fatigue, they can take up a significant amount of water. As water is pulled from your bloodstream and into your cells, this effectively decreases blood volume. If blood volume is decreased, then of course the concentration of thyroid hormone will increase, but only because there is less blood and not because there is more thyroid hormone. If you take this into account, the total amount of thyroid hormone actually decreases. And these researchers fail to account for this loss of blood volume that exercise causes. There’s also a lot of research that demonstrates this as well. There are lots of studies that show these same results, but I think you get the point. Forcing yourself to exercise as a means of losing weight or trying to “boost” your metabolism can actually have the opposite effect and result in the further suppression of your thyroid, a slower metabolism, and ultimately more future weight gain. Sounds kind of counterproductive, right? This is one of my favorites because it goes to show you how far behind most people are when it comes to understanding exercise and physiology. The media, your doctor, your next door neighbor and everyone else who still has a bit of sanity left will tell you that running is one of the best ways to burn calories and lose weight. Running is far better than walking, right? When exercise physiologists study energy expenditure and derive their energy calculations, they fail to account for the brain in their calculations. And your brain produces huge amounts of energy and requires a huge amount of fuel. Just because you’re exercising doesn’t mean that your brain shuts off and stops working. It’s still working and expending energy, just like your muscles. Russian physiologists, on the other hand, are accounting for the brain. And by stimulating the brain and therefore increasing its energy expenditure, your brain can contribute to burning significantly more calories. So, Russian researchers have shown that stimulating your brain while you walk can actually be more beneficial than running on a treadmill while your brain is minimally stimulated. If you take into account that walking would be far less damaging to your thyroid and metabolism, you can effectively support your thyroid and burn more calories on average by walking in a mentally stimulating environment than running while bored. The bottom line is that the current understanding of exercise and physiology is severely lacking and it’s only further contributing to our generally declining state of health today. And in today’s world, your thyroid really does need all the help it can get. Millions of people today are not only hypothyroid, but are also making their hypothyroidism worse by following all of the bad exercise advice out there. When millions of people are led to believe that something like exercise is always beneficial to their health, while they’re unknowingly causing more damage to their thyroid, then we really have an epidemic problem. Hopefully this opens your eyes up to the fact that exercise, as it relates to hypothyroidism, is something that needs much more care and attention. Doctors, so-called health experts, and popular media all mean well. However, the reality is that they’re steering you off the edge of a cliff. At Forefront Health we do things differently. Our mission is to provide you with the resources you need to keep you on the road back to thyroid health. Exercising with hypothyroidism isn’t about exercising harder. It’s about exercising smarter. And that’s exactly what we teach in our Hypothyroidism Exercise training. We show you exactly how to stop letting exercise ruin your thyroid and how to start using it to boost your thyroid instead. You can get all the details about this Hypothyroidism Exercise training by clicking here. Yes…have known exercise uses up adrenal and thyroid hormone. I am dependent on taking thyroid medicine and need progesterone for adrenal help and need to take more progesterone when exercising and watched thyroid medicine wear off also. Awesome insights from this site! Thank you! Tom, I get it. The problem now is that you are preaching to the choir. What we are lacking out here, just do a hypothyroid search, is the lack of access to a medical community that understands any of this. I am searching for my fourth Endo because my current Endo just wants to take away what T3 med I have regardless of worsening symptoms. Talking to docs about any of this just gets blank stares or condescension. Thanks for the info. U know help is out there just have to find it here in Indianapolis. Lack of medical care is a major problem and unfortunately one we don’t have control over. That’s a large part of our mission here at Forefront Health… to provide the tools and resources for thyroid sufferers to successfully take control of their own thyroid health, rather than depending on a medical system that refuses to help.